Call Me By Your Name is a stunning movie visually, emotionally, and in terms of its casting. The pacing is fairly slow, but in a way that builds tension and expectation, rather than in a sense that it drags. Being a keen linguist and musician myself, I loved those little moments, and the way the two lead characters bonded over those shared interests. (The classical score was also perfect.) Armie Hammer is, I believe, a hugely underrated actor, and he gives a star turn here, as does his young co-star, Timothée Chalamet. However, for me, the standout performance was from Michael Stuhlbarg. His role is very secondary at the start, but towards the end of the film, he has one scene with Chalamet in which he gives the most beautiful, nuanced monologue, and it is worth seeing the film for that scene alone. 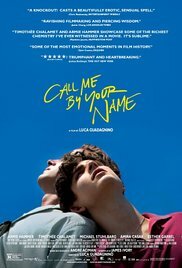 With a poignant, bittersweet ending, this is not a happy film in the fairytale romance sense; however, in many ways it is very life affirming, and there is a subtle beauty in the melancholy. Go and see this film if you are looking for a thoughtful, memorable drama. I will definitely be heading off to read the original book now.